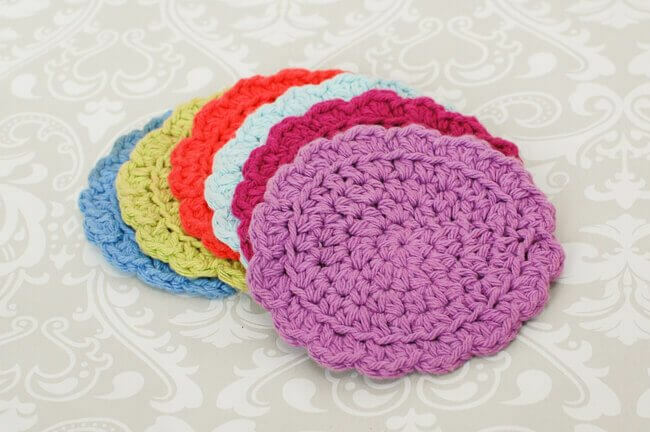 This quick and easy crochet coaster set is the perfect summer project … small, lightweight, and super portable. Just stash it in your bag and your all set for the beach, car trips, or wherever your summer plans take you. Finished coasters measure approximately 5 in. diameter. Make a magic ring (as an alternative to the magic ring, you can ch 4 and join with a slip stitch in furthest chain from hook to form a ring). Round 1: Ch 2 (counts as hdc here and throughout), work 7 hdc in ring, join — 8 sts. Round 2: Ch 2, work 1 hdc in same st as join, work 2 hdc in each st around, join — 16 sts. Round 3: Ch 2, work 1 hdc in same st as join, work 1 hdc in next st, *2 hdc in next, 1 hdc in next, rep from * around, join — 24 sts. Round 4: Ch 2, work 1 hdc in same st as join, work 1 hdc in each of the next 2 sts, *2 hdc in next, 1 hdc in each of the next 2 sts, rep from * around, join — 32 sts. Round 5: Ch 1, working in back loops only for this round, work *3 hdc in next st, Sl st in next, rep from * around, join — 64 sts.